For our God “is and was and will be,” Alpha and Omega. God is now. The remembering and simultaneous hope for future brightness are the ways we come to know who we are in response to this God. Do you remember “Choose Your Own Adventure” stories? These were books for pre-teens that were published from 1979-1998. I suppose there are digital versions of the same concept but this was before the internet. You would read a couple of pages defining at least the main character and then be faced with 2 or 3 choices of what the protagonist should do next. Each choice would direct the reader to turn to a later page number and several pages after that the reader would encounter more choices flipping back and forth throughout the book. Eventually, the reader would choose the ending to the story. The plot and ending of the story thus had 40 or more possibilities.Do you remember “Choose Your Own Adventure” stories? These were books for pre-teens that were published from 1979-1998. I suppose there are digital versions of the same concept but this was before the internet. You would read a couple of pages defining at least the main character and then be faced with 2 or 3 choices of what the protagonist should do next. Each choice would direct the reader to turn to a later page number and several pages after that the reader would encounter more choices flipping back and forth throughout the book. Eventually, the reader would choose the ending to the story. The plot and ending of the story thus had 40 or more possibilities. I always thought that was a great idea. In this way the child could experience interaction with the story and practice creativity and adventure and learn something about choices as well. It’s a story that you can read and choose your own ending. Last week I told you a story that was actually a memory from my childhood. And today, I confess it was not accurate. That is to say, it wasn’t exactly what happened. I don’t trust my memory to be that accurate. Some of that story was likely from other parts of my actual history. Like, I probably placed the experience of getting lost at the edge of the woods at Camp Ahistadi and it really happened at Camp Sequoya or some such detail. And, the thing is, it really doesn’t matter. What matters to me is that I got across the experience that I remember and a message of the importance of community and family. What’s more important than historical fact in that story is that I created a metaphor from which to talk about Advent as a time of quieting our souls, a time of remembering who we are and a time of coming home. Two Sundays ago, I told you one of my husband’s military stories. I totally messed up the the details of that story. I told you that as a military chaplain he once tromped through the jungles of Peru. It was Panama. It doesn’t matter. Christ is still in the water of our baptism. So, do the details or historical facts of such a story ever really matter? I think we can get bogged down in such arguments over The Story - our story, our Biblical story of how God created, sustained and loved the world so much as to send God’s only Son. We can get bogged down in an effort to define the historical Jesus and miss the meaning of the message. 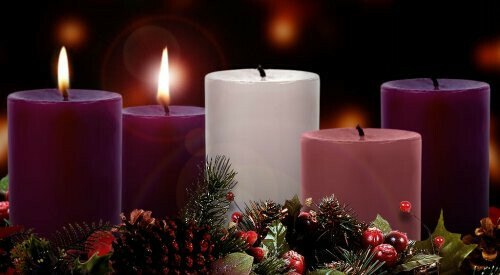 Advent is a time of preparing our hearts all over again for that great gift and so we tell the story again. But where is the beginning of the story? We know the end - the end is Easter, the Ascension and all that comes ever since. The middle is the Baptism of our Lord, the Temptation in the wilderness, and the teaching, preaching and miracles of our Lord. The middle includes the arrest, torture and crucifixion of our Lord. The beginning? Well, it seems that is where we are in the story today. John came out of the wilderness and baptized with water. Then he baptized Jesus. Eventually we were also baptized. Joe and I binge watched a short run series on NBC called “Timeless” last year. It got canceled and I’m still on a cliff hanger wondering if they ever got back to real time unharmed! It really wasn’t very good, but I got caught up in that fantasy of jumping around through time. There are hundreds of such TV and movie storylines out there. And one theme is that the characters from the present must not interact with the people they encounter in the past lest they upset the “time-space continuum.” Whatever that is. We love the fantasy of playing with time. I guess we long to go back and fix things or go forward and see how things turn out. The “Back to the Future” movies had a story line about a book of sports scores that one bad character used to cheat at gambling by taking it back in time and so he got rich that way. Perhaps there are a variety of desires in the fantasy of leaving the present and going back or forward in time. I wonder why that is so appealing. Why do we have so much trouble with just living in the present? Isaiah (Second Isaiah) encouraged the Judean exiles in Mesopotamia that their time of persecution was coming to an end. He said that he had received the message from God that he should comfort God’s people with words of hope that God was raising up one who would allow them to return home to Judea and to the ruined Jerusalem. In that instance it was Cyrus of Persia who entered the city of Babylon as a liberator. Cyrus effectively defeated the rulers of Babylon without “firing a shot.” He allowed conquered people to practice their own religions and to return to their homelands. Familiar with this story, Mark’s account of the gospel begins with John the baptizer - which is descriptive of what he did rather than Luke who named this central Advent character John the Baptist. By quoting the Isaiah passage, Mark put’s John also in the wilderness preaching the importance of faith which gives us a radically different perspective. When John called for repentance, he literally called for people to turn around. The reading from 2 Peter speaks to those in the very early Church who scoffed at the idea of the coming of Christ. Already there were those who believed that Jesus had been born and died, perhaps even wondered if he may have been raised from the dead, but they apparently were tired of waiting and had stopped living as though he would come again. That is to say that God in Christ would establish the eternal reign of peace, justice, and reconciliation that would be the culmination of history as we experience it. So to them we hear Peter asking what sort of persons ought you to be, answering his own question saying they (and we) should lead lives of holiness and godliness, waiting for and hastening the coming of the day of God. The scoffers then, and now, have come to accept the status quo — the way things are is pretty much the way things have always been and always will be. This reflects a worldview of those with too little imagination; people who are too shortsighted to imagine that God might be involved in the now of human history. When given a choice between two extremes, Episcopalians in good Anglican fashion will typically say yes! Do you want a salad or something fried? Yes! This is our way – the middle way - the Via Media. Are we more comfortable in church dressed in suits or in jeans? Yes! Do we seek to demonstrate our faith through social justice outside the confines of historic old church buildings? Or do we retreat into these old beautiful spaces and take comfort in the introspective, communal, and sacramental life of faith? Yes! When the Church focuses too much on social justice, we fail to invite people into the community of faith where we do not abandon the notion of God as now. We should practice our faith as though there is an obvious connection between eschatology and holiness, between ultimate consequences and present actions - waiting for and hastening the coming of the day of God. So, my friends is the beginning of the story when Jesus was baptized or when we were baptized? Is the beginning when Jesus was born or when Moses told the Israelites how to prepare for the first Passover, to save their first born? Is the beginning of the story ancient or is it yet to come?